Minou was a difficult rescue. I should have expected that. After all, I had just had a quick and easy rescue the day before, so the law of averages had to catch up with me sooner or later. What's worse, however, is that it did not end well. Minou fell to the ground from a height of 40 feet. He is doing fine now, but the way he landed on his side had me concerned. He ran off immediately and hid as one would expect, but I wanted to make sure he was alright as soon as he emerged from hiding. His owner, Mary, called me later that evening and reported that he was fine and eating heartily. That was a huge relief to me. But the rescue did not end the way I wanted, and I felt badly about it. Minou had just recently appeared at Mary's home far out in the country. Though cautious with her at first, he quickly decided to adopt this new home and owner and settle in. He allowed her to pet him, pick him up, and he even liked to sit in her lap. Mary told me that he does not run from strangers, so I was cautiously hoping for a cooperative cat. Maybe I could lure him into a carrier with food, or maybe he would allow me to get close enough to scruff him into a bag. I was wrong. 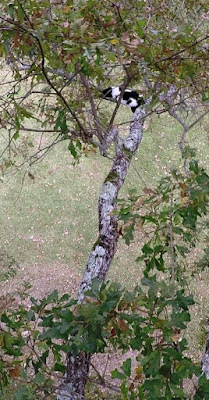 When I arrived, he was resting on a branch next to the main trunk of the tree about 30 feet high. I picked out a good branch to which I could tie my rope and began climbing up to him. Well before I could get near him, he walked all the way near the end of his branch and settled in there about 16 feet away from me. I opened the can of food and offered it to him, but he showed little interest. He was not moving, so I would have to get closer to him. I walked out farther on his branch to get closer to him and tried to snare him with my rescue-pole, but he and the tree conspired to sabotage my every attempt. When he walked even farther out on the branch, Mary and her son held up a swimming pool net on a very long handle to shoo him back toward me. That worked so well that Minou actually came back very close to me. Indeed, he was so close now, that I could not use my rescue-pole. The pole is 7 feet long when not extended, but while he was far out away from me, I had extended it to about 9 or 10 feet. When he came close to me, I could not position it in such a way that I could snare him with one end while reaching the opposite end to pull the noose snugly around him. My arms are not long enough for that. As he walked back out on the limb away from me, I had enough distance that I could snare him, but he scooted right through the noose so quickly that I had no time to pull it tight. So we start the same process all over again: I try to snare him with the pole; he walks farther out the limb; Mary and son shoo him back; he comes back too close to me again. This time I could see him looking for an escape route past me, but I knew he would not dare to walk over my own feet. I was wrong again. That little stinker flew over that branch so fast without even touching my feet. I watched in shock as he ran over my feet past me, climbed up the trunk of the tree and walked far out to the end of another branch much higher. This rescue had turned into a battle, and Minou was winning. I felt deflated and seriously considered calling it quits and returning the next day. I was already tired and dehydrated. But there I was already in the tree, and I didn't want Minou to have to spend another night there. 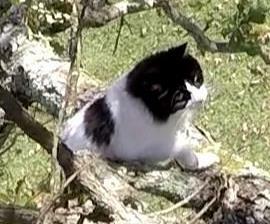 I pressed on and positioned myself on a branch below Minou. 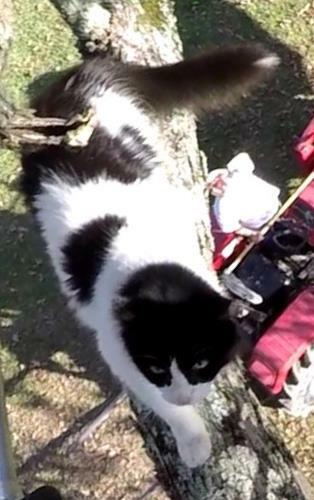 I walked out on the branch as far as I could and could barely reach Minou with my rescue-pole fully extended to 12 feet. He was straddling the space between two tiny branches with his hind feet on one and his front feet on the other. I approached him from the rear and tried, with difficulty, to push the noose under his hind feet. I managed to do just that and was in position to tighten the noose around his chest just behind his front legs. At this point things got a little hazy, and I am not sure what went wrong. He began turning and moving while I was tightening the noose. With his long hair, it was difficult to see exactly where the noose was positioned, especially at that distance. As I began to pick him up to bring him toward me, he started struggling, and then I was not sure if I had snared him in the proper position. Very quickly he squirmed out of the noose and fell to the ground. What's worse is that he appeared to land on his side. He immediately ran under a truck and hid. He stayed there until well after I had left. I felt terrible. After he ran up higher in the tree, I should have just quit and returned to try again the next day when I was not so tired. It is not easy to snare and handle a long-hair cat on the end of a 12' pole while standing in a precarious position, so I probably should have at least used the pole to force him to walk closer to me where I could then snare him from a closer and better vantage point. But, fortunately, he seems to have survived his fall just fine and is happy to be back on the ground. I don't have any worthy video of the rescue. I had the camera on my helmet, but to preserve battery life and memory space, I turned it off whenever I spent some time re-positioning myself in the tree. With all the difficulty Minou gave me, I turned it off and back on so many times that I simply did not know if the camera was on or off anymore. As it turned out, it was not on for the finale, so I have no video of his fall. That is both good and bad. It is a painful sight to see, but I could benefit from watching it slowly to see exactly what went wrong. I could learn from that. So, I send apologies to Minou and Mary. I wish I could do it all over again. I would be better prepared for Minou to run over my feet, and, this time, I would have my net ready to scoop him up as he passed by. He would have hated it, but that would be much better than a fall, and I would be sleeping better.